Sri Lanka is THE destination on all travel journalists lips right now. Personally I think the hype is a little bit exaggerated. But there are sights well worth a visit - one of them is the classy Galle Face Hotel in Colombo. 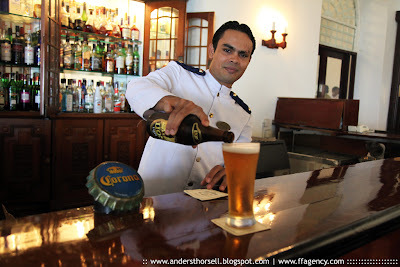 In this picture Shehan, the bartender, is serving an ice cold well tasting Lion Lager.